Help us Enrich. Inspire. Educate. Collaborate. Build Community...one note at a time! We're on a mission to build community one NOTE at a time! SAVE THE DATE to join this global day of giving fueled by the power of social media and collaboration. This #GivingTuesday you can help us "Enrich. Inspire, Educate, Collaborate. Build Community one NOTE at a time!" Every donation matters, whether it's $5 or $500! We appreciate your donations to the Anchorage Opera, as ticket sales only account for 30% of our operating expenses, your donations truly make a difference. We rely heavily on private donations, grants, and revenues generated by fundraising events. Only with the continuing support of dedicated patrons like you can we realize our mission of being the center of artistic creation, innovation and education through the presentation of opera and related events encouraging public collaboration and community engagement for the people of the State of Alaska. Thank you for being an important part of achieving this mission. Anchorage Opera has been commended for its collaborative work with other arts and cultural organizations in Alaska including the Alaska Native Heritage Center, the Anchorage Symphony Orchestra, Alaska Dance Theater, Anchorage Concert Chorus, and the Alaska Children's Choir. Other partners include the Alaska Center for the Performing Arts, Anchorage Public Library, Alaska World Affairs Council, Anchorage School District, Identity, Inc., Alaska Veterans Museum, Anchorage Museum at Rasmuson Center, Anchorage Concert Association, TBA Theater and the Perseverance Theater. Anchorage Opera also has a strong relationship with UAA and provides opportunities for aspiring vocal and instrumental students to work alongside professionals. Each year, we serve thousands of adults and youth, residents and visitors through multiple community and education partnerships, mainstage performances and related events. From educational partnerships with the Anchorage School District that includes free student dress rehearsals and school lunch Flash MOBperas, to active partnerships with a wide variety of Alaskan organizations and an ever-expanding list of patrons and supporters, all of Alaska reaps the benefits of AO's operations. 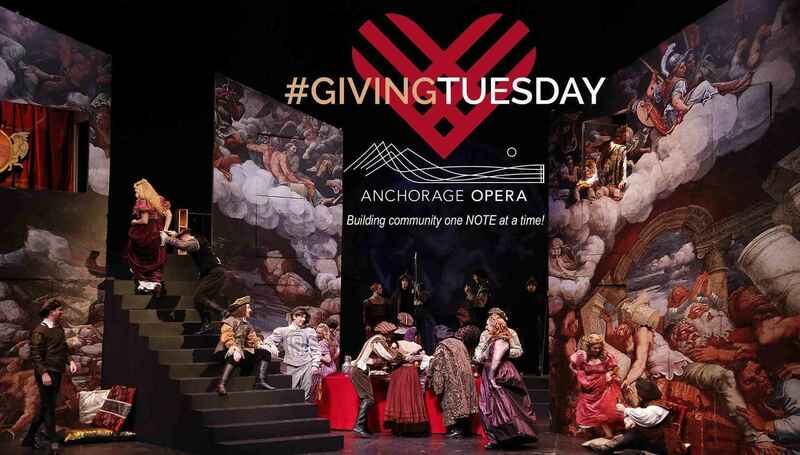 As it was in the beginning, generous individuals and institutions from all parts of the community including the members of AO's Board of Trustees, a dedicated core of volunteers, the Anchorage Opera Guild and many others give of themselves and their resources to ensure that AO's grand tradition of enriching Alaskan life continues undiminished. Anchorage Opera is one of the largest producers of the performing arts in Alaska and the first opera company in North America founded in the circumpolar North in 1962. Additional information about Anchorage Opera can be found at www.anchorageopera.org.